Welcome to the Palladium issue of The Funding Crowd! Yep, 46 appears to be a reasonably interesting number, apart from representing aforementioned element on the periodic table. It's a semiprime, for instance, which means that it's a natural number which is a product of two primes (2x23), it's the designation of Messier object in the Puppis Constellation, it's the number of human chromosomes and finally, it has nothing to do with Douglas Adams. So, a lot to live up to, frankly. Read on to see how we do! If you like experimental, narrative-driven adventure games, then a•part•ment is for you. It's the story of an all-too-familiar situation: a breakup, the end of a relationship. Enter the life of recently-dumped Nick, and examine his memories of happy times past, as well as the lives of his neighbours. As a story-driven, text-focused game, reading will be a fundamental part of the game, not unlike visual novels. You're going to experience Nick's thoughts and memories during his grieving process. All the while, he'll create a comic detailing his relationship with his ex-girlfriend. Other sections, telling the stories of his neighbours, will feature interactive vignettes from their point of view, with mechanics specifically tailored to the situation at hand. These tales all connect to explore the universal nature of our relationship troubles. Is this the sunset of Nick's life... or just the dawn of a new relationship? With 2 more days to go and 90% of their $20,000 funded, success seems likely. If you want to give them a hand, $15 will give you the game and a silly breakup tweet, and add another $15 for the soundtrack. For a more standard mystery point-and-click adventure game in the vein of Broken Sword, you'll want to back Oak Island. Unravel the secret of a true mystery, and find the hidden treasure. Wait, a true mystery? Yes, a true mystery. In 1795, a mysterious stone with hieroglyphs was discovered on Oak Island, Nova Scotia, Canada, and the hunt for the treasure described on it never ended. Several people even died on that hunt, and their deaths were never fully explained! Sure, critics claim there's no actual treasure to be found, but, pah, what do they know?!? Based on this legend, the people behind the fan project Zak McKracken: Between Time and Space created a gripping tale embedded in a classic point-and-click adventure. Control three characters, solve puzzles, manage your inventory, and find the ancient treasure... that probably belongs in a museum, come to think of it. Meet Oak McKraken and the alien treasure hunters... or something like that. Given the developers' previous experience, the legend around Oak Island is definitely in good hands. Charles Cecil of Revolution Software (Broken Sword series) and Jan Theysen of King Art (The Book of Unwritten Tales) agree: they both endorsed the Kickstarter campaign. So, what are you waiting for? Oak Island is calling! With currently 17,000€ raised, the first episode is already funded, and the next two at 25,000€ also seem likely. Do make this happen by giving them 15€ for the game or the soundtrack, or 25€ for both. Or, if you feel so inclined, there are several other perks at higher levels. This Gem is a dark Gem. A simple question, "Where is your son?". The answer to that question is an over-the-shoulder third person romp through a dark wood as "Karen", the missing boy's mother. Since you're re-telling the story of what happened, the narration during gameplay will dynamically change based on your actions. While there's no direct reference to the Supergiant game on the project page, the way it's described brings to mind Bastion's narrator. 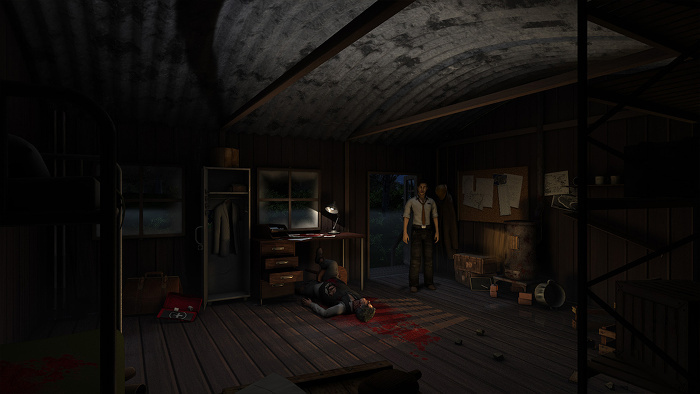 The eerily calm narration also brings to mind Gone Home and certainly the Norwegian developer, Antagonist, admit that it was an inspiration, alongside others such as Alan Wake, Amnesia: The Dark Descent and The Last of Us. That last one stands out. Surely a mother rescuing her son from a wood doesn't involve a zombie invasion, right? Well, no, not quite. It does, however, involve a lot of Norse mythology and its associated woodland monsters. Some of these you'll have to run from, others you'll have to outwit. Alone in the woods, in the middle of the night, and near an abandoned cabin. What could go wrong? 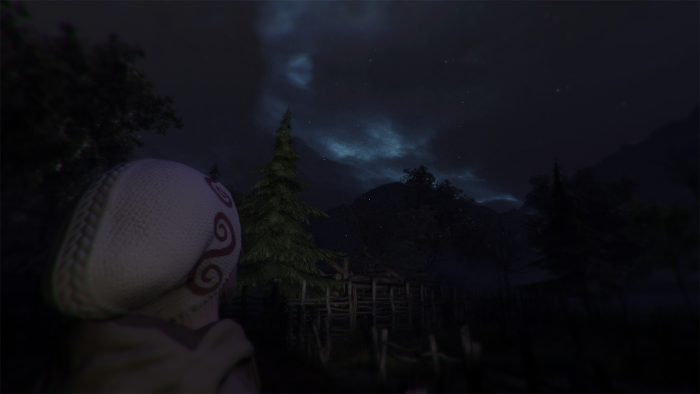 If the sense of foreboding and slow build up of terror is familiar, perhaps it's because the Norwegian development community are a close-knit bunch and Antagonist have thanked Krillbite Studios, creators of previous crowdfund success, Among the Sleep, for their help. There are still nearly 300 early bird options at $15 to get on board with Through the Woods, then it's $18, or $30 for two copies if you want maximum value after the early bird ends. It's just over a third of the way to its $40k target with little less than 3 weeks to see out the rest, so it could certainly use a bump. It's due in February next year. Trials has a lot to answer for. What started out as a Java-based browser game featuring 3 bikes and 3 increasingly challenging tracks was later turned into a 3D extravaganza in Trials 2 for Xbox360 and just last year launched on Steam, Xbox One and PS4 under the banner Trials Fusion. What it couldn't have forseen, however, was the sheer number of clones that popped up on the mobile store fronts. Indeed, the very game we're writing about is already available on Google Play and iOS stores and this Indiegogo campaign is all about bringing the game to a wider audience. There's no such thing as too much turbo for your car. Unlike many of its clone brothers, such as Hill Climb Racing or Up Hill Racing, Road Racer Hills is commendably free of the concept of in-app purchases, at least for now. 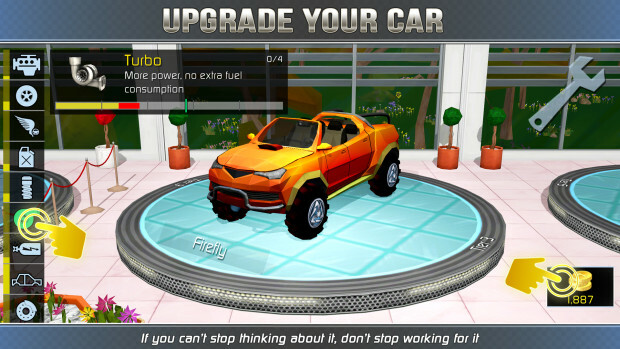 You earn upgrades for your vehicle by simple progression through the game and not by buying, say, 10,000 coins for $5. The upgrades are extensive. The usual upgrades for your car are available, including suspension, engine, fuel tank, turbo and so on. You can also buy alternative vehicles from a reasonably sane number of options. Finally, there are pets that will grant certain abilities at key moments, such as a slow motion feature, or flipping the car if it's going to land upside down. 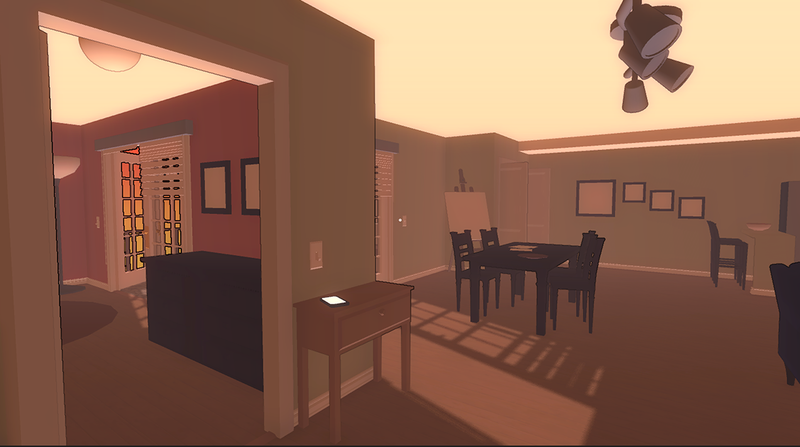 Developer Blue River Arts are also adding a few ideas of their own to keep gameplay fresh. There is, for example, a day/night cycle which will require you to upgrade your headlights for better visibility and there's even a weather system which will affect game play --wind, rain and snow affecting your traction and air time. This is an Indiegogo Flexible Funding campaign, which means that your pledge will be taken immediately, regardless of whether the campaign reaches its intended target. On this occasion, we feel that this shouldn't bother you because you can already download a very engaging alpha version right now. There are a handful of early bird offers at $10, then your pledge of $20 will secure you a desktop licence. If you love adventure puzzle platformers like Rochard and Teslagrad, Winterflame: The Other Side is sure to pique your interest. It's a gorgeous looking fantasy game where you use different elemental powers to solve dozens of puzzles across five distinct areas. The creators also promise an epic story line based on an award winning Indonesian novel series. Lev, the protagonist of the upcoming game, has a special gauntlet that enables him to wield powers based on the four elements of nature. One is a root that can be used both as a grappling hook to gain altitude and to pull objects. Another is a protective bubble, which also gives Lev the ability to levitate. The last two powers are projectiles, where the fire element heats and burns things, and the wind element creates a vortex that pulls on loose objects. It will also be possible to combine these elements for other effects. The game has been a surprise hit on Kickstarter so far, enough that it is closing in on its $68kCAD goal, with a few days left of the campaign. You can help get it over the finish line by pledging at least $20CAD for a digital copy of the game. Their primary focus seems to be on the Steam platform, where they were greenlit after just a week. The youngest among our readership may not be aware of it, but there was a time not so long ago (it's not that long ago, right? RIGHT???) when if you wanted something to succeed, you had to put 2000 somewhere in its name. Now, 15 years into the then mythical and fascinating 21st century, arrives Power Drive 2000. 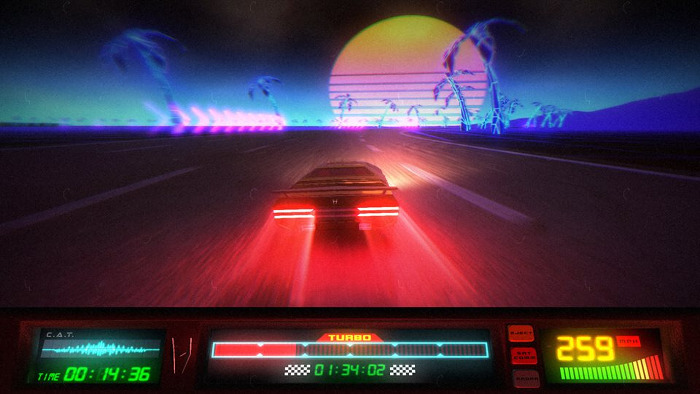 It's an arcade racer trapped in the 80's vision of what the year 2000 would look like: lots of neon lights and a mind-bogglingly technologically advanced car with turbo boosts and a talking on-board computer. Gameplay-wise, it only offers two main mechanics: boosting and drifting. The main catch is that the former totally relies on the latter, i.e. in order to charge your boost you'll first have to drift along some curves. Easy concept to grasp, but quite difficult to master in an optimal form as to be the best driver of the year 2000. To kind of compensate for such a reduced set of game mechanics Power Drive 2000 offers up to 6 different race modes, including an outrun mode in which you'll have to escape from a police helicopter, or a vaporizer mode without checkpoints and with deadly fences all along the track. Judging from the available videos the game looks pretty fast and fluid, but what promises to set it apart is its massive soundtrack, made by a looong list of synthwave artists. In order to get it -along with the game, of course- you'll need to fork out $37CAD, but for only $12CAD you can secure a copy of the game. A DRM copy of the game, mind you: in a certainly strange decision from the devs, if you want it DRM-free you'll have to up your pledge to $18CAD. 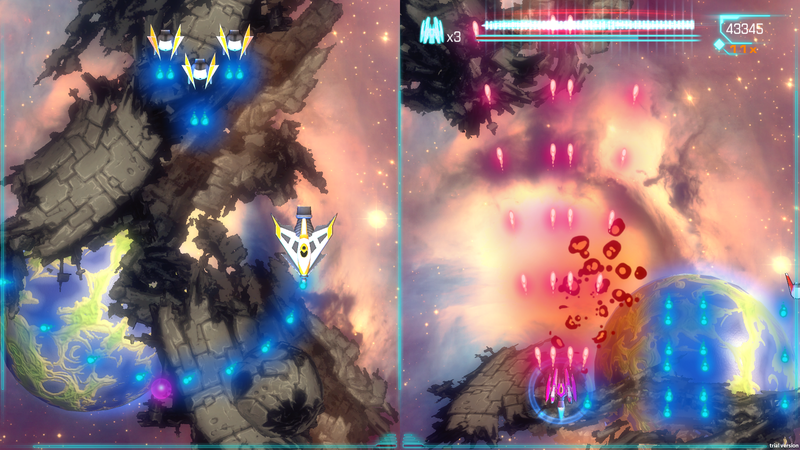 When we were preparing the previous issue of The Funding Crowd, we considered talking about an interesting mix of SHMUP and puzzler by the name of Dimension Drive, but in the end it didn't make it to the final article. Which was probably a good thing, as during the last few hours of the campaign the devs went from hell to heaven and back when a life-saving, last-minute 7,000€ pledge was revealed as fraudulent and thus the game wasn't funded after all. But the guys from 2Awesome Studio, far from accepting defeat, they immediately launched a new campaign and they are determined to get funded this time. And certainly the second time seems to be the carm for them as, with more than 3 weeks to go, they have already beaten their previous funding mark. So, with its success being almost a certainty, let's talk about what it is about. As we said earlier Dimension Drive is something of a puzzle-SHMUP, but to quote its devs we'll add that it's «a comic book-styled space adventure set in a multidimensional universe.» Since saving the Earth is so cliché here the player, taking up the role of Jackelyne Tywood in her ship The Manticore, will have to save the entire universe from being conquered by the nasty Ashajuls. This warrior race has been conquering the universe one dimension at a time with the help of the Dimension Drive. Luckily, Jackelyne's ship is also equipped with a Dimension Drive, so she's the only hope we have against them. What's more stressful than a bullet-hell shooter? A two-screen bullet-hell shooter, of course! This backstory perfectly sets up the stage for the game's main mechanic: each level is split in two different halves, and the ship has the ability to warp/teleport between them at will. Moreover the ship's weapons consume energy, and this energy can only be regained by destroying enemies... in the other side. So there's an added strategical element to it, which forces the player to constantly shift between one half of the screen to another, be it to regain some energy to be able to keep fighting, or to avoid unpassable obstacles. Some might think that lack of multiplayer is a severe drawback, but we sincerely don't know how it could be successfully implemented given this game's foundational premises. And anyway, as we also mentioned, the Kickstarter campaign is well on its way towards being overfunded, so there certainly seems to be a numerous target public for the game as it is. If you feel you're part of this public, you only need to pledge 12€ to secure a DRM-free copy plus a Steam key. Double it (25€) if you want beta access and your name in the credits. Please follow us to the next page to know our no less than four Biggies, as well as the fates of our former picks! Umbra looks damn sweet and that apocalyptic form is epic! I don't often back (or play) action RPGs, but I think I might have to make an exception for this one. flesk Umbra looks damn sweet and that apocalyptic form is epic! I don't often back (or play) action RPGs, but I think I might have to make an exception for this one. Yep, I was gobsmacked by the graphics and imagination when I was researching that - and it's right up my street too. So many fine Gems and Biggies in this one. My wallet be hurting!